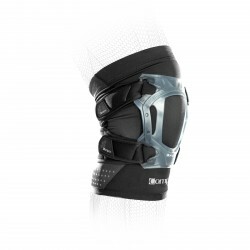 The Compex Bracing Line Webtech patella tendon support iis suitable as relief when you face problems in the kneecap or the patella tendon. The flexible silicone membrane surrounds the kneecap and fixes it softly and reduces the movements. The silicon absorbs additionally the shock movements and distributes those on the whole knee structure. This pressure distribution mainly protects the sensitive patella tendon and prevents effectively inflammations and irritation. The flexible materials adapt ergonomically to the features of the user. It is recommended for pains in the front of the knee and for preventing from early signs of wear.